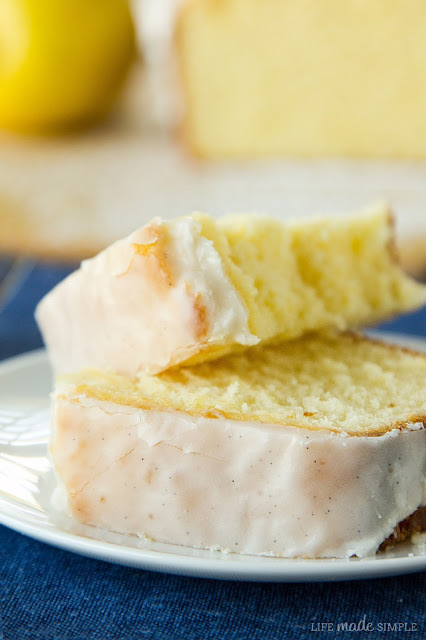 Lemon Pound Cake with Vanilla Bean Glaze - Hi, friend Popular Recipes, in this article entitled Lemon Pound Cake with Vanilla Bean Glaze, we have prepared this article well and concise to be easy to understand for you to read and can be taken inside information. hopefully the contents of the post Article baking, Article bread, Article cake, Article food, Article lemon, Article loaf, Article recipe, that we write this you can understand and useful. okay, happy reading. When I came across a version of this recipe it was love at first sight. I've always been a huge fan of pound cake, but this recipe promised a pound cake that was moist and fluffy. That sounds a little weird for pound cake, right? But really, who wants to bite in to a dense, dry cake? So I went to work adjusting things here and there so that it would be extra moist and so that the lemon flavor would really pop. Instead of doing a lemon glaze for the top, I opted for a light and simple vanilla bean glaze. That was a great decision! The cake turned out to be everything that I had hoped for- moist, fluffy and flavorful. Stephen was circling the cake as it sat on the counter and kept asking me when it would be ready to eat. As soon as I had photographed it we cut ourselves a few slices and dug in. He agreed that it would be perfect with poppyseeds and I thought it would be great with a handful of fresh blueberries! I hope that you'll give this recipe a try, you won't be disappointed! Enjoy this lovely summer treat! 1. Preheat oven to 325 degrees. Place your rack in the middle of the oven (mine was the second "shelf" from the bottom). Lightly grease one 9x5 loaf pan with butter, then lightly dust with flour, set aside. 2. In the bowl of a stand mixer, beat together butter, sugar, lemon zest, lemon juice, lemon oil, and vanilla for 3 minutes (on medium-high) or until light and fluffy. Add sour cream, beat until incorporated. Add eggs one at a time, mixing to incorporate after each addition. 3. In a small mixing bowl whisk together flour, baking powder and salt. With mixing speed on low, gradually add dry ingredients, mixing for an additional 45 seconds after all of the dry ingredients have been added. Remove bowl from stand and fold in any "mix-ins" (blueberries* or poppyseeds), if desired. 4. Pour batter into prepared pan and spread evenly. Place in oven and bake for 1 hour or until the top becomes golden brown in color. Remove from oven and allow to cool in pan for 20 minutes. 5. Meanwhile in a small saucepan over medium heat, combine sugar and lemon juice to create a syrup. Once sugar has dissolved allow to gently simmer for 2 minutes. Remove from heat. 6. Remove loaf from pan after 20 minutes of cooling. Using a toothpick or cake tester, poke holes into the top of the cake- lots of 'em! Brush the syrup over top (and the sides too) so that it seeps into the cake. Allow the loaf to cool for another 1½ hours before frosting with glaze. 7. To prepare the glaze, in small mixing bowl, whisk together the powdered sugar, milk, vanilla bean paste, and salt. It may not look like a lot, but a little goes a long way, trust me! Spread over the loaf and allow to drip over the edges and sides. Allow to sit for 20 minutes to harden before serving. NOTE: If you are planning on folding in blueberries, toss them in flour before adding, this will help prevent them from sinking to the bottom of the loaf. NOTE: You can find vanilla bean paste (Nielsen-Massey brand) at Williams-Sonoma, Sur La Table, King Arthur Flour and many other baking stores. Thank You and Good article Lemon Pound Cake with Vanilla Bean Glaze this time, hopefully can benefit for you all. see you in other article postings.